Home | Next: The Photoshop Challenge! | Next: South Dakota is cool. After parting ways with everyone at the St. Paul capitol building we stuck with Roger Johnson and headed to Wisconsin. Shortly after leaving St. Paul we crossed the bridge into Wisconsin. 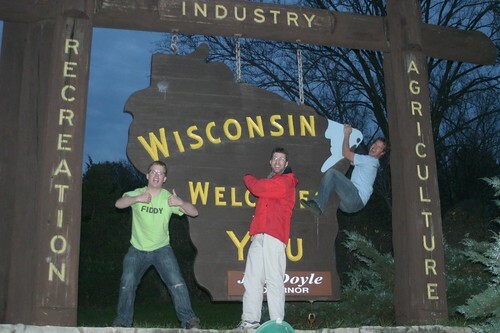 I could see the 'Welcome to Wisconsin' sign ahead and didn't want to miss a great photo-op. Suddenly Roger swung his Dodge Caravan across three lanes of traffic, narrowly missing other motorists, he found a break in traffic, pulled onto the shoulder, jumped the van onto the highway embankment and parked right beside the sign. Obviously we were in the company of an expert. Here we got a series of welcome sign photos with the world’s first self-proclaimed welcome sign photography expert. Roger approved of our welcome sign styles, I suppose he gave us it the seal of approval. Roger took us an hour or so in Wisconsin and dropped us off in Menomonie for Dan to pick us up. It was here Fiddy announced he would only eat cheese in the state of Wisconsin, for life! So far he has stayed true to his word. Dan, a Wisconsin local goes to University in Menomonie for mechanical engineering. He saw us on Digg.com and wanted to help out. He eagerly dropped all his Sunday night plans at short notice to take us into Madison, WI. Dan and his truck cruised us into Madison in no time. Funny thing about this truck too, his grandpa hit a tree going 45 MPH in reverse, and it only left a tiny dent. Don't know what he was doing going 45 MPH in reverse, but it sounds like something amazing was going on. 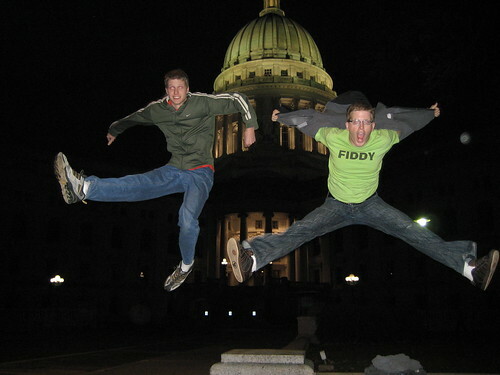 After a few hours we were in Madison, just in time to get some night time jump shots. But wait, there’s more. Alexandra was planning on coming to Madison on Sunday night, from Illinois, but decided to put if off until Monday morning. So she too got in on Madison jump shots round two.